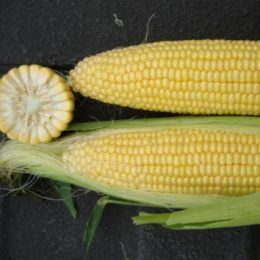 SHY6RH1036 is an ideal fresh market F1 hybrid sweetcorn in the sh-2 class and is known for its superb quality, bright yellow kernels with straight rows and perfect tip fill, even under mid-summer temperatures. Orla is a new yellow sh-2 F1 hybrid with an outstanding disease resistance. Orla has a very uniform cob, straight rows and high pack out. Majesty is a bi-colour super sweet F1 hybrid and known for its consistent performance, good tip fill, and larger cob size when compared with other varieties. MMZ0200 is a medium early maturing yellow super sweet F1 hybrid with quality and flavour. Plants are medium in height and withstand lodging well.